Etchings on fine laid paper with thread margins. Two early states taken from the same etching plate before it was lettered for publication. Hollstein 39 (F W H Hollstein 1954, “German engravings, etchings and woodcuts c.1400-1700”, Amsterdam); see also Holl. 36–47; resp. Le Blanc 10–21. Condition: lifetime impressions trimmed close to the platemark. Both prints are in good condition (i.e. there are no tears, holes, folds, significant stains or foxing). 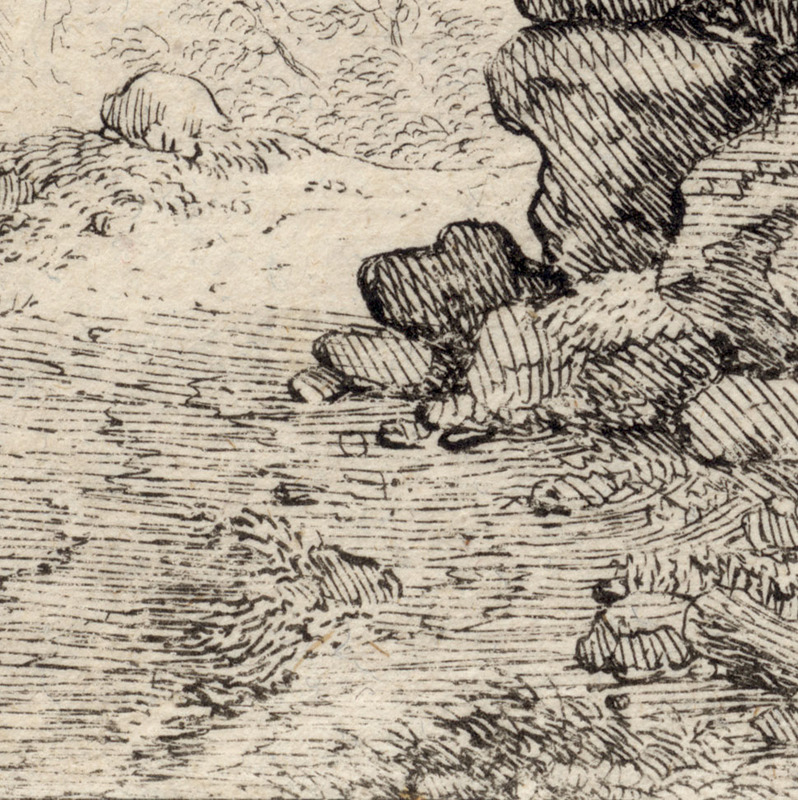 The slightly lighter toned print is either an earlier state or the impression has been wiped too firmly resulting in some of the detail appearing faint. I am selling this pair prints taken from the same etching plate for the total cost of AU$226 (i.e. the combined price of both prints) (currently US$174.76/EUR161.79/GBP140.17 at the time of posting this listing) including postage and handling to anywhere in the world. If you are interested in purchasing these exceptional rare early impressions, please contact me (oz_jim@printsandprinciples.com) and I will send you a PayPal invoice to make the payment easy. Initially, I imagined that I would have no difficulty in finding information about this etching. After all, Meyer is one of the major Swiss landscape artists at the turn of the 17th century and why wouldn’t there be a plethora of information waiting “out there” for me to discover? I was wrong. Not only is the easily sourced information about Meyer fairly fundamental—in the sense of giving a broad timeline for his practice without much elaboration—but even the main institutions (The British Museum, Rijksmuseum and the Met) had only meagre collections of his prints. 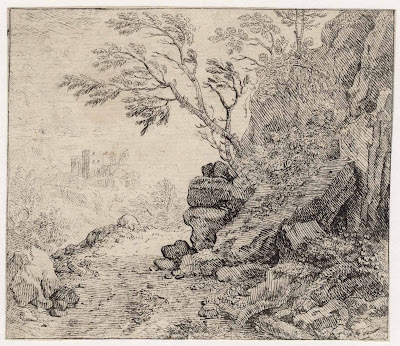 What I did discover from reading between the lines was that he had a nodding acquaintance with Georg Philipp Rugendas and Johann Melchior Roos (I have discussed both of these artists in a previous posts). 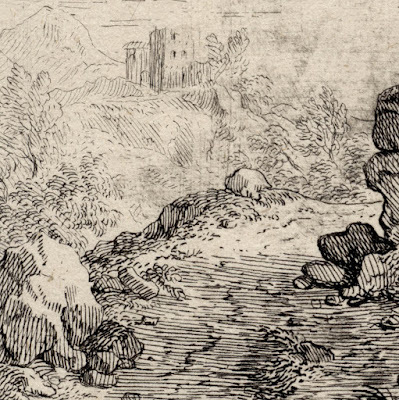 Indeed, according to Michael Bryan (1816) "A Biographical and Critical Dictionary of Painters and Engravers”: “In company with Roos and Rugendas, he [Meyer] was indefatigable in designing the most picturesque views of Switzerland …” (p. 62). This insight about his association with these artists made me stop and think and I can now see hints of shared interests between the artists. For example, I view Meyer’s virtually untouched/line-free sky area as relating to his peers’ use of similar large slabs of untouched paper. Moreover, I would have little difficulty in arguing that Meyer shares a similar approach to orchestrating pattern of lights and darks in his compositions. 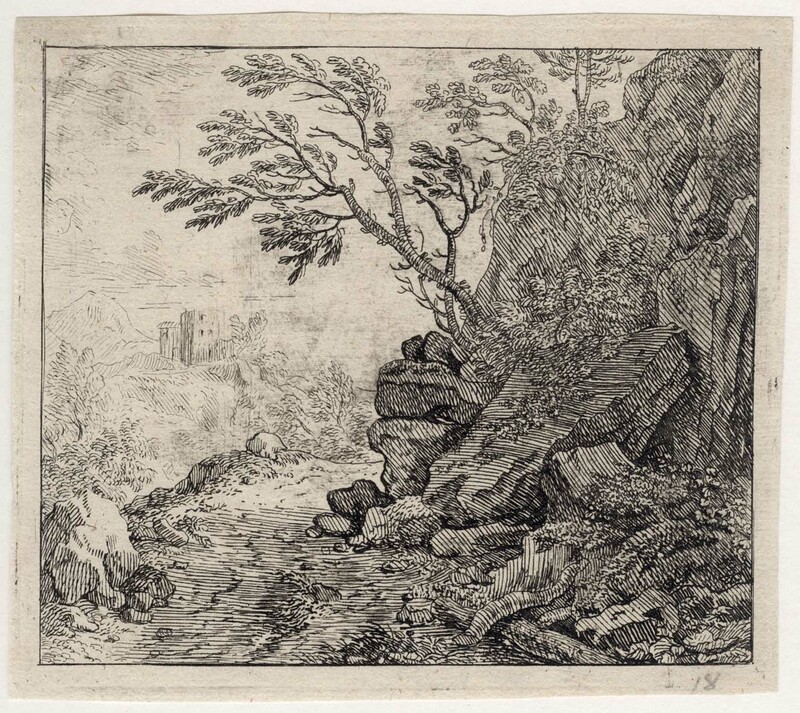 Although this is a Swiss landscape, the design elements—landscape features that suggest a timeless state and a distant ruin—are much the same as those found in any idealised Italianate landscape of the 17th century, whether it was executed in Italy or in far-flung reaches of the Netherlands. Indeed, so widely spread was the love of such timeless landscapes that their construction was even formalised by Gerard de Lairesse (the head of the Amsterdam Academy) in 1707—even though he had never actually been to Italy. Like all artists wishing to express the concept that an ideal landscape is timeless (amongst a host of other notions driving artists at this time) the key design elements—viz. 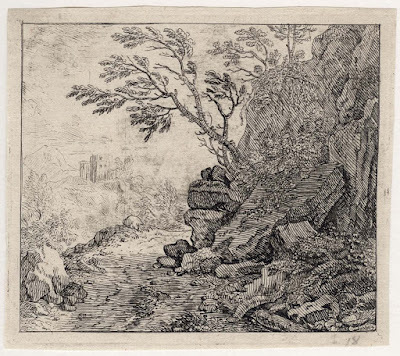 a winding road, a rocky outcrop, trees and a distant ruin—needed to be set in place before the less important, superficial details were added to a composition. For me this approach of laying down the fundamental design elements first is like Stephen Covey’s practical advice about how to fill a bucket with rocks and sand—an analogy used by Covey to explain best practice of prioritisation in management: one can fill a bucket properly by putting the big rocks into the bucket first and then add the sand later, but never the converse of putting the sand in first and adding the rocks later.